The holidays were a great time to work on some crafty projects. I just finished up a wall hanging for the baby of a dear friend. I’ve done a Winnie-the-Pooh cross stitch for each of her children, and this was for her first girl. I got the pattern from a book called “P is for Pooh” that I bought a few years back. 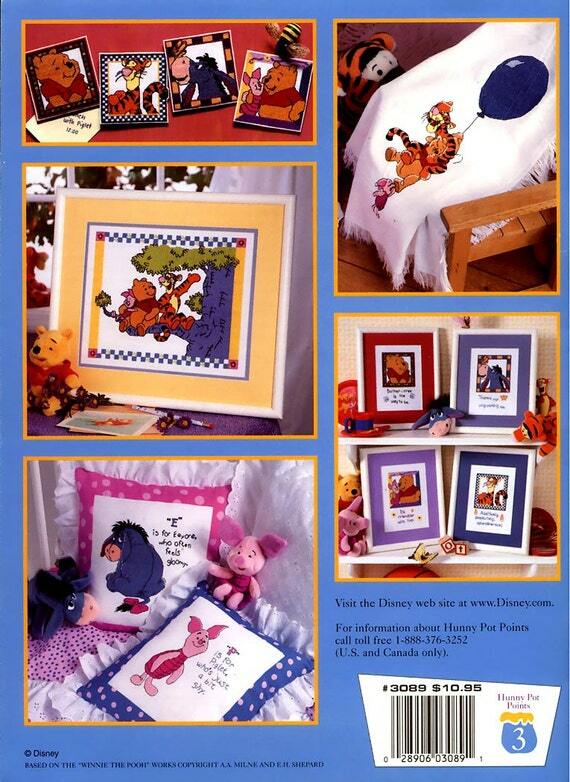 I actually mixed two patterns: the Pooh+flowers design is from one pattern, and border is from another. I adjusted the size of the border to fit the frame and mat I bought. The text font is actually from a third pattern. I love doing these for friends and family, but I’m a little behind. I haven’t even started the kit I bought for my niece that was born last year! Last weekend I attended a scrapbooking retreat, which is exactly like it sounds. I made a quick album of my photos from last year’s trip to Disney World and Harry Potter World at Universal (using this pre-designed album from Creative Memories). 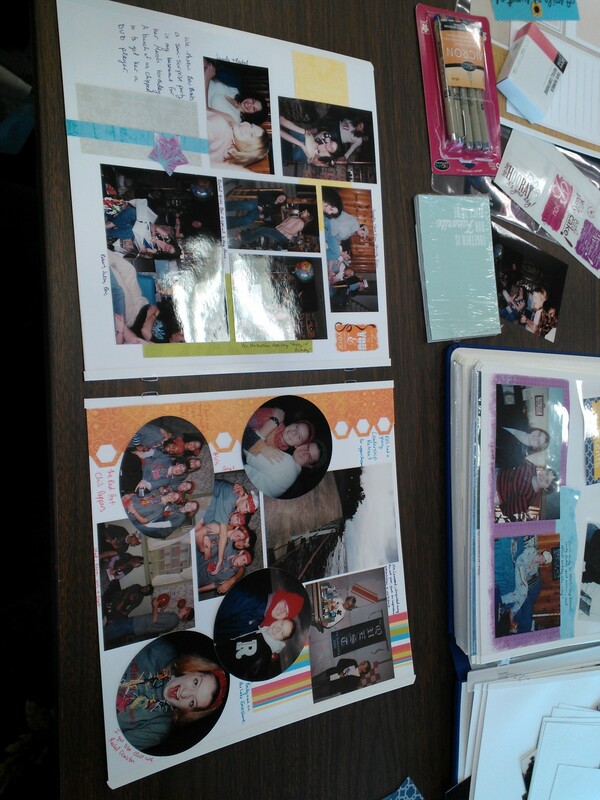 I love making scrapbooks, and I’ve done all kinds. Besides obvious ones for vacations and my wedding, I also made one of pictures of my cat when she passed away, and I made one of favorite places in my Florida hometown when I moved to Ohio. For me it’s always been a great way to relive meaningful memories while using some artistic creativity. I use pre-designed pages and digital software a lot, but I also just enjoy starting with some printed 4×6 pictures and a blank page and decorating from there. Here’s my step-by-step process for scrapbook page design that gives me something a little different every time. 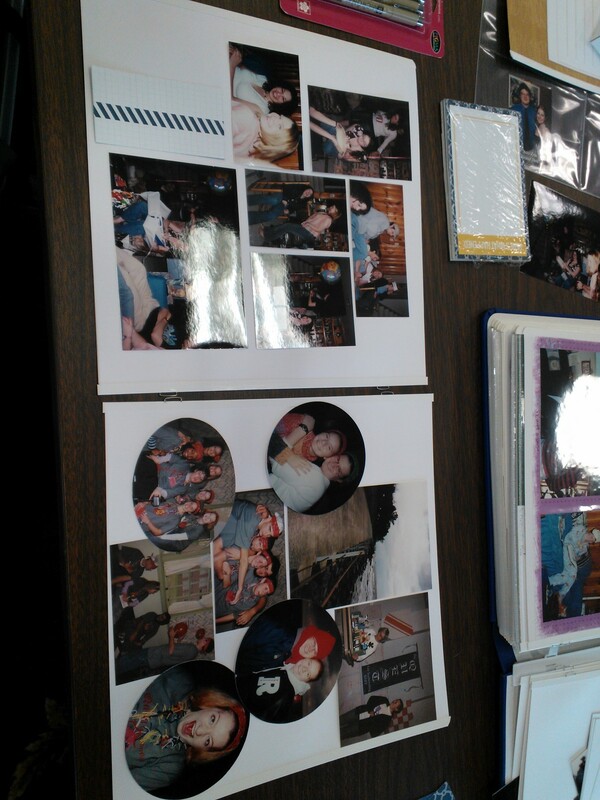 1.Sort photos and group them onto pages. I’m a planner, so I like to set out which pictures are going on which pages; otherwise I would run out of pages! This often results in my putting up to 10 pictures on one page, which is fine, I just have to get creative about placement. I usually work in double page spreads for coordination, even if the two pages are about different events. Unless I already had a specific layout in mind for the page, I usually just crop each photo for content and focus in the best way I can. Sometimes I do all squares or something, but usually it’s a mix of shapes. 3. Lay out photos, etc. on the page. This is the fun part where I actually have to fit all the photos on the page, while ideally leaving some room somewhere for writing, and any other memorabilia that go on the page. 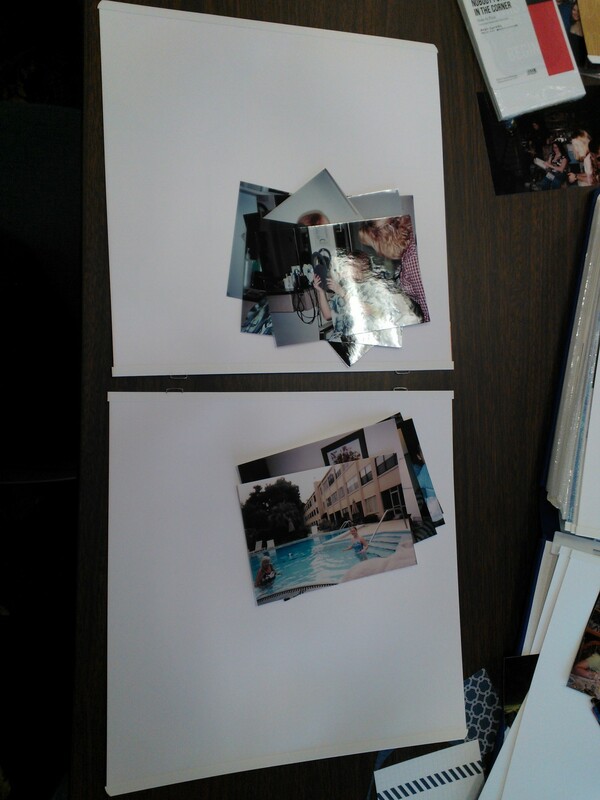 These pages of 6 and 8 photos are pretty typical for me (that’s why cropping is so important!). I am not a fast scrapbooker (or “scrapper”); this step can take me a while. There’s always that one photo that just doesn’t want to fit. I often take a picture of the page at this point so I can remember how I had everything arranged, because I’ll have to move the photos to add any paper behind them. Now I’ll select background paper, borders, or stickers based on the colors or theme of the photos. I rarely “wallpaper,” or put a whole sheet of paper covering the white page behind the photos; I typically just add some photo mats and pieces and parts here and there. I’m always saving scraps from previous pages because you never know when they’ll come in handy. Sometimes I’ll use coordinating papers/embellishments I purchased as a set, but more often I just go through my whole stash and find things I like together (I don’t think any of the embellishments above are from the same “set”). I’ll also do some journaling on the page; writing is an extremely important part of scrapbooking. Looking at photos is cool, but it’s even better if you know who exactly is in the photos and why you were taking them. Do you guys like to scrapbook? Do you prefer digital or “traditional” scrapbooking? Do you prefer pre-designed pages or designing your own? I recently became an aunt again, so I busted out the cross-stitch to make a baby present. My sister-in-law loves elephants, so a lot of the things I make for my nieces have elephants on them. These elephants come in various colors, but pretty much never actually grey, like real elephants. These ones are blue. In any case, I picked this stamped cross-stitch bib because it looked simple (I did one like it for my other niece), but in fact, it had two types of embroidery that I’d never done before. The butterfly wings were done with satin stitch, which basically fills in the whole area, and the antennae (and the grass) were done with stem stitch, which is like an overlapping backstitch. For the past few weeks, I’ve been in “project mode,” making curtains for our home office. The ones it came with (when we moved in over 2 years ago) were fine, but dark and heavy. My husband is doing some work from home right now (ah, the life of a software developer), and we are trying to make the room look a tad more professional, since he has daily Skype sessions with his clients and bosses. The office is also where I write a lot of the time. And where we play TOR. It has most of our books, and a tiny old TV hooked up to old gaming systems like the PlayStation and N64. We want it to be like our happy nerd haven in the house. So, we picked a simple, cheery fabric, with vertical stripes that are conveniently easy to sew on. The pattern is basically a giant rectangle, with a few touches to make them hang well, etc. My mom and I made these from scratch; she did all the ironing and pinning, and I stitched all the seams. We added blackout material as a lining to keep the room dark when they’re closed. Even working only a few hours a week, it took less than a month to do these. And since we bought the fabric and hanging rings with coupons, plus fairly cheap curtain rods from Target, they cost the same, if not less, than comparable curtains from the store.